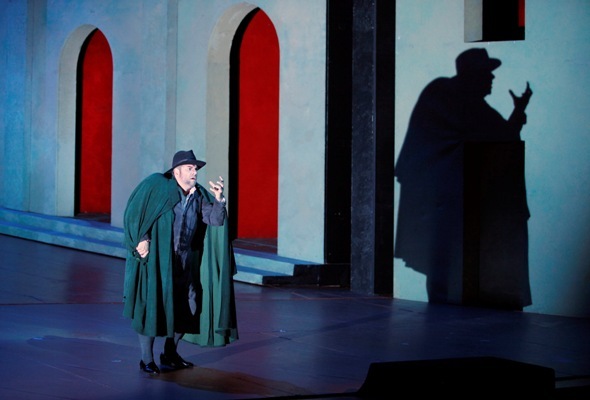 If the rest of the San Francisco Opera season lives up to its opening “Rigoletto,” opera lovers in the City by the Bay are in for a treat. Well sung, beautiful to look at and quickly paced under the baton of music director Nicola Luisotti, it was a fitting tribute to composer Giuseppe Verdi on the eve of his bicentennial year. Rigoletto is an often-cruel court jester who thinks life is a bunch of laughs until somebody turns the joke on him. Željko Lučić is powerful in the role (which also will feature Marco Vratogna in a double-cast production on alternate dates). He is sardonic and sneering, inspiring hatred and fear in his fellow courtiers until, in revenge, they kidnap his supposed mistress for the pleasure of the Duke whom they all serve. Then he becomes fearful, angry and, in his great scene, “Cortigiani,” a broken man, pleading for mercy. In reality, Gilda, the girl, is the innocent daughter of the jester and his attempts to regain her and avenge her shame provide some of the most powerful drama – and beautiful singing – in all opera. Polish soprano Aleksandra Kurzak, who will share the role with Albina Shagimuratova, is nothing short of a miracle in the role. Lovely of face, with a clarion sound to match, she conveys the sheltered Gilda’s innocence and confusion with conviction. You see, the problem is that Gilda actually loves the rapacious and womanizing Duke, who has wooed her in the guise of a humble student. Even after her violation and increased evidence of his faithlessness, she is willing to give her life for him. Kurzak makes us believe it. Her great aria “Caro nome” was a limpid coloratura tour de force and her duets with her father – the baritone-soprano combination that was a Verdi specialty in operas such as “La Traviata” “Aida” as well as this one – elegantly performed. Francesco Demuro, who shares the part of the Duke of Mantua with Arturo Chacón-Cruz, had a cold on the night of Sept. 11 when I attended, according to a pre-performance announcement. Not that you would have noticed. His singing made you wonder what he would sound like in perfect health. Handsome and lithe, he had the kind of swagger appropriate to the character. The cast is rounded out by basso Andrea Silvestrelli as the deep-voiced assassin Sparafucile and mezzo-soprano Kendall Gladen as his slutty sister Maddalena, who lures victims to their doom at the point of his sword. I personally love Michael Yeargan’s scenic design for this production, based on the modernist, slightly surreal paintings of Giorgio de Chirico, all slanted angles and doorways to mysterious places. Sure, it’s old but it’s terrific and a great example of “if it ain’t broke, don’t fix it.” Costumes, by Constance Hoffman, are sumptuous, especially in the opening ball scene. Hanging over all productions of “Rigoletto,” is The Curse. This one is pronounced by an old man, Monterone (Robert Pomakov), whose daughter has been ruined by the Duke, foreshadows the fate of the jester who mocks his shame. Its musical motif appears in the overture as well as several other points in the drama. “La Maledizione” is not only the last line of the opera but, in Verdi’s early drafts, was to have been the title. It helps to know the superstitious power of curses as well as the prevalence of “vendetta” (vengeance) in Italian culture in order to swallow the plot. The music, on the other hand, goes down easy.